For hydrangea motif size and sheet layout see Specifications below. 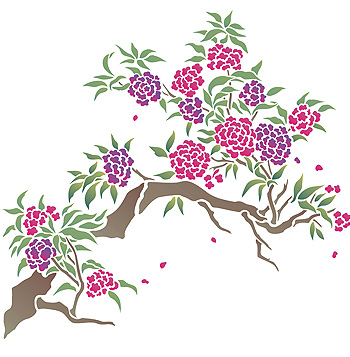 The Chinese Hydrangea Stencil is part of the Blossom Branches Range. 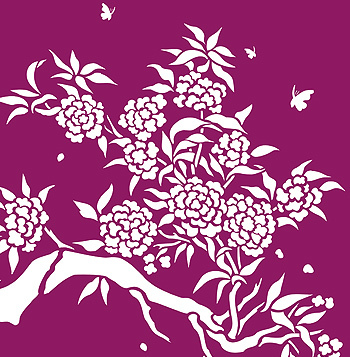 Hydrangea flowers in full bloom on a graceful, arching bough make up this beautiful single sheet stencil with an oriental flavour. 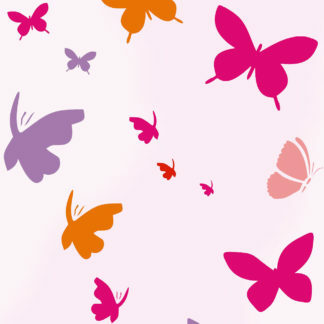 Use this stencil to add a focal point of beauty and elegance to feature walls, panels and curtain drops. The Chinese Hydrangea can be used as a single motif or ‘grown’ by tilting and repeating it to create interesting repeat patterns and features. This design lends itself to naturalistic hydrangea flower colours, or striking single colours, or subtle tone on tone colour combinations. 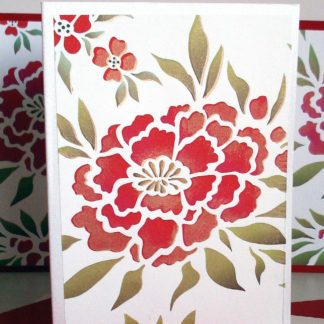 Above – the Chinese Hydrangea Stencil repeated in a vertical column, stenciled in Very Berry Stencil Paint on a cream background. 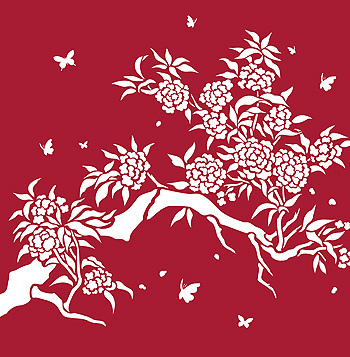 Above – the Chinese Hydrangea Stencil is stencilled in rich reds and purples to give a splash of colour on a white background. 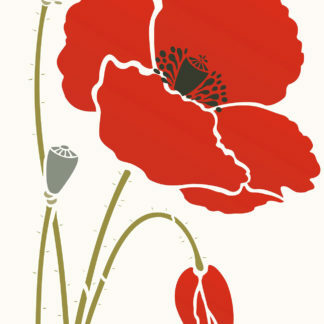 Stencil Paints used here – Cerise, Indian Purple, Hedgerow, Woodland and Coffee Bean. 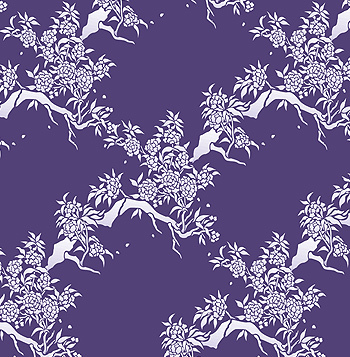 Above – the Chinese Hydrangea Stencil is stencilled in slightly softer tones of lilac and purple on white. Stencil Paints used here – Damson, Indian Purple, French Lavender, Hedgerow, Woodland, Chocolat and Estuary Grey. 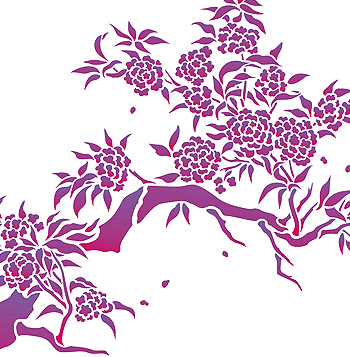 Above – the Chinese Hydrangea Stencil looks striking in this simple treatment – stencilled in Very Berry Stencil Paint ‘blushed’ with Bengal Rose Stencil Paint on a crisp white background. 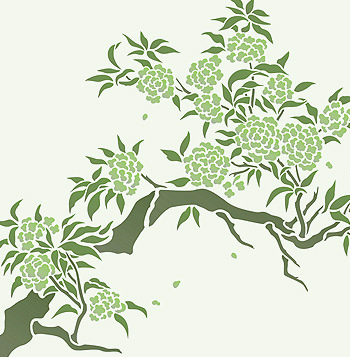 Above – the Chinese Hydrangea Stencil in soft, chalky greens and greys for a restful, harmonious effect. Stencilled here in Eucalyptus, Blue Sage, Estuary Grey, Shoreline and Mocha Stencil Paint (Mocha is mixed with the grey for this effect). 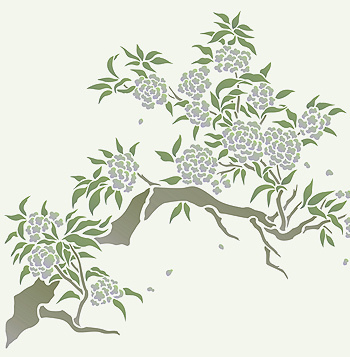 Above – the Chinese Hydrangea Stencil in restful greens on a pale grey background – stencilled in Ash Green, Hedgerow and Woodland Stencil Paints. 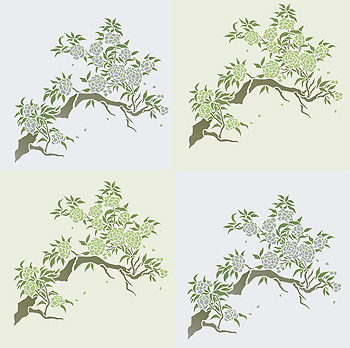 Above – the Chinese Hydrangea Stencil is repeated here in subtle painted squares of grey – Stencil Paints used same as two illustrations above. 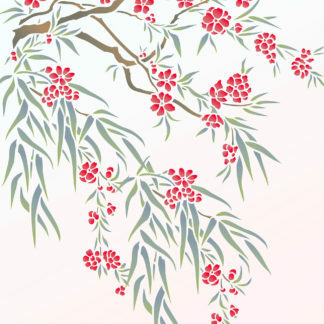 Our other blossom branch stencils incude the Japanese Blossom Stencil, the Oleander Blossom Stencil, as well as our popular Cherry Blosssom Bough Stencil and Extra Large Cherry Blossom Stencil. 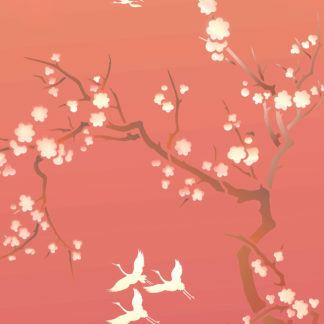 Above – the Chinese Hydrangea Stencil is shown here in crisp Ice White Stencil Paint on a warm red background with some butterflies from Little Butterflies Stencil 1. 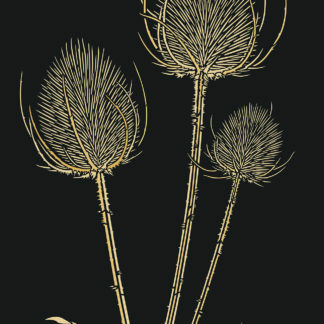 Below – the same treatment is applied on rich purple. 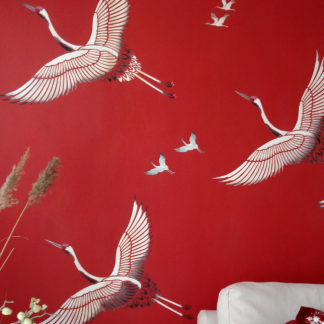 ‘blushed’ with Cerise Stencil Paint. 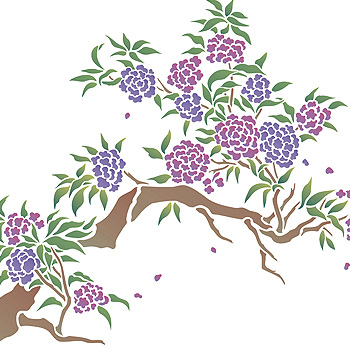 Above – the Chinese Hydrangea Stencil is repeated and tilted to create a ‘growing’ tree effect – stencilled in the same colours as above on a pale lavender background for a unified feel. 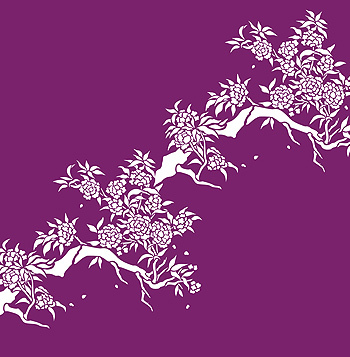 Above – the Chinese Hydrangea Stencil in Ice White repeated diagonally on a bright purple background. 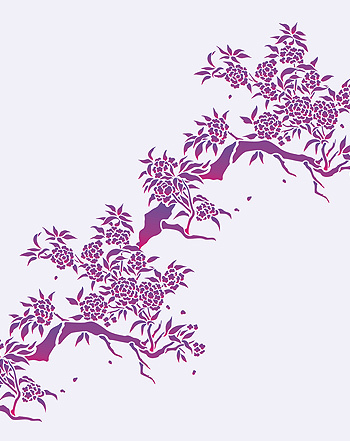 Above – for impressive wallpaper style, the Chinese Hydrangea Stencil is repeated in diagonal lines, stencilled in Orchid Stencil Paint. 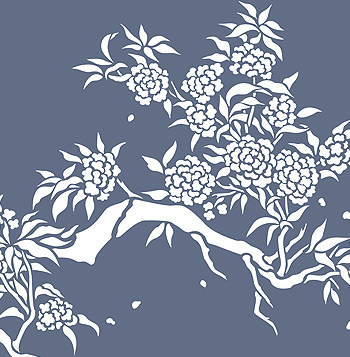 Above – close up section of the Chinese Hydrangea Stencil in Ice White on a charcoal grey background. One layer single sheet stencil. 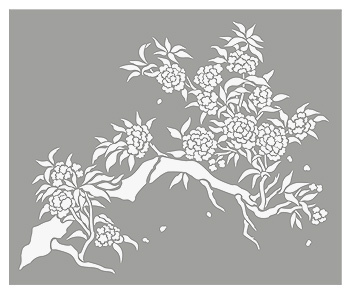 The overall hydrangea motif measures up to 75cm (29 1/2″) wide by 61cm (24″) deep. The hydrangea flowers on average measure up to 9cm (3 1/2″) wide, with leaves between 3cm (1 1/4″) and 7cm (2 3/4″) wide. 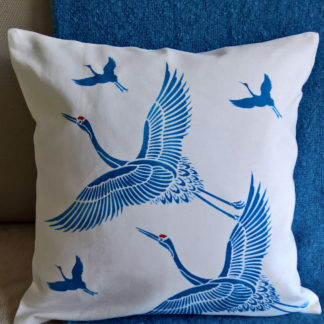 Sheet size 81cm (32″) tall x 67cm (26 1/2″) wide. 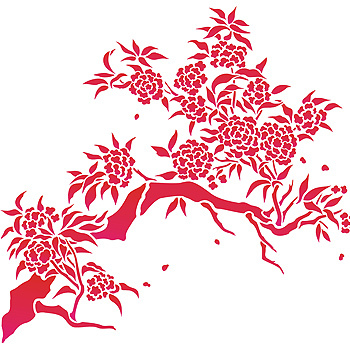 Left – layout of the Chinese Hydrangea Stencil.